By the time you read this, Tim Cook, chief executive of Apple, the world’s most valuable company, would be back at his home in California where he wakes up at 3:30 am every day. He’d just have concluded a visit to India where every move of his was tracked not just by the media, but by arch Korean rival Samsung who had deployed people to keep track of every move of his so that it may be reported to its headquarters in Seoul. Why? Apple is sitting on $233 billion in cash. So, without a doubt, every government in the world will want a piece of the most valuable company in the world. As things are, by the end of this year, China will emerge as the most potent player in Apple’s longer term scheme of things. The country is important to Apple because it is poised to replace the US as its biggest market. But China has demonstrated more than once that it is eminently capable of holding the gun to Apple’s head to suit its needs when push comes to shove. Some of Apple’s recent wobbles in China (in the first quarter of 2016, Apple posted a 13% drop in revenues. Falling sales in Greater China, which includes Hong Kong and Taiwan, were responsible for 58% of that decline. Apple’s revenues from Greater China declined by $4.3 billion to $12.49 billion) aren’t just about not having enough winners in its product portfolio or indeed, the same product saturation that’s affecting key smartphone markets across the world. Apple is running into unexpected political headwinds in China. And unless it loosens its purse in China, it could find itself denied market access, just as it did with the delayed launch of the iPhone 6 for seemingly inexplicable reasons, according to Stratechery’s Ben Thompson, a leading technology writer based in Taipei. Nobody likes a gun to their head. How do you get past it? As for the India story, Apple’s current revenues are in the region of $1 billion, says an analyst who declined to be named. For a company that generated $233 billion in revenues in fiscal 2015, $1 billion is chump change, to put it mildly. So why was Cook expending time in India? Then he’s got to deal with an Indian government that insists Apple manufactures iPhones in India to fit into its Make in India strategy. So far, Apple has remained non-committal. And perhaps for good reason. Assuming Apple and Cook agree to make in India, the Chinese will get into the picture once again in the form an animal called Foxconn. The Taiwanese contract manufacturer is Apple’s manufacturing partner in China. And Foxconn’s track record in India has been anything but exemplary. And if all this isn’t enough, Cook has another situation on hand. Apple wants to sell refurbished phones because it has a carefully thought through strategy. But the Indian government won’t let it do that. Add to all of this the fact that Apple is no longer a computer or handset manufacturer. It is transitioning into something else altogether—the contours of which are still unclear. The territory Cook is navigating on is a compelling one—and very different from what he inherited from Steve Jobs. The fundamental difference between the two is that what Jobs followed was a Deliberate Strategy. In other words, Jobs tried to fundamentally redefine an existing category, every time he launched a new product, be it the iPod, iPad, iPhone. As opposed to this, Cook is dealing with an Emergent Strategy. At one end, he has to continually push the boundaries of Jobs’ original strategy. In other words, he has to use design to re-imagine a category and/or boldly go in a different design direction. And at the other end, Cook also needs to break out of the predominantly hardware mindset that defined Apple in the Jobs era. He needs to lay greater emphasis on crafting a new culture around services and software. And that is clearly unchartered territory—and no one is quite sure whether Apple will be able to transform itself. How Cook steers through these waters will be one of the most compelling corporate journeys we will be witnesses to in our lifetimes. Let’s take it one thing at a time. Until now, a good part of the discourse around Cook’s visit to India has been that Apple ought to set up manufacturing facilities. Bad idea. To understand why, take a look at the chart below, computed by Business Insider. 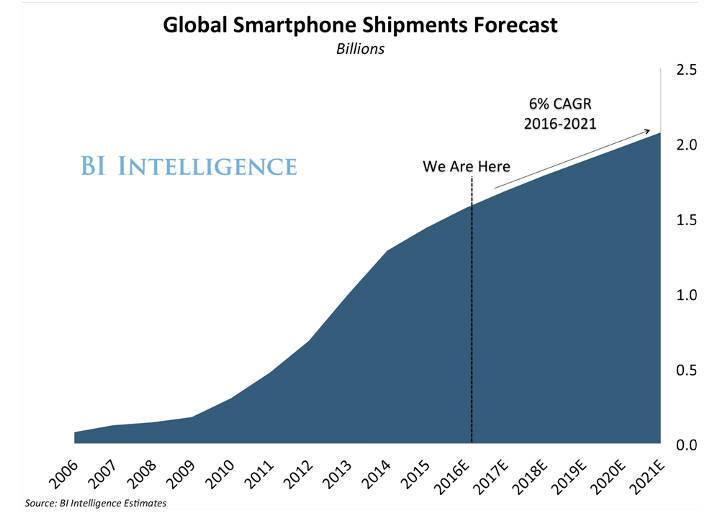 Global smartphone shipments are getting close to saturation. In Apple’s case, it went one step ahead and argued that when people buy an Apple product, they buy an experience. Selling an experience translated into an astounding set of numbers. In the retail sales business, Apple averages the highest sales per square foot among US retailers, at $5,009. Any retailer would give an arm and a leg to get to these kind of numbers. No other technology company has thought along these lines. Instead, all they are engaged in is tweaking their products into better creatures. But as the chart above indicates, the peak is on hand, everybody knows about it, but few know what to do next. Dig one layer deeper. Prasanto Roy, a veteran technology writer who contributes to global publications and is based out of Delhi, points to an interesting set of numbers as articulated in the chart below. This was originally put out by CyberMedia Research (CMR). 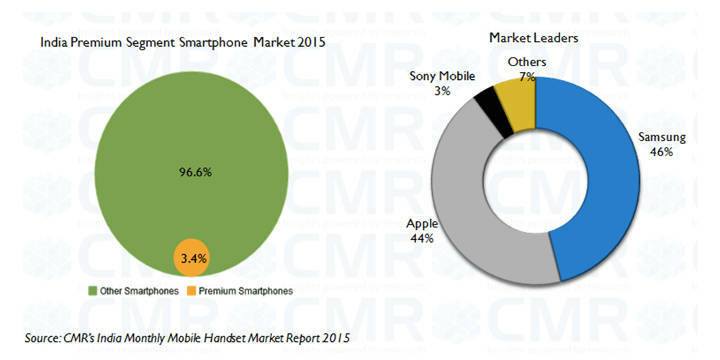 The report states that in India, 96.4 million smartphones were shipped last year. Of these, 3.3 million (or 3.4%) were premium smartphones (those that cost over Rs 30,000)—most of which came from either Apple or Samsung, with Samsung having a lead in both segments. CMR reckons these numbers could go up to 5 million by the end of 2016. Does Samsung have the muscle to wrestle the lead here? Possibly. Does Apple want to? Short answer. No. Apple has taken a clear stance that it is a premium brand and wants to stay there. “It will only play in a certain price point. Nobody will play in a certain price point. It will not operate in a certain segment. Ninety percent of global handset profits are taken away by Apple. That gives you the answer. So why would I want to play at the Rs 5,000 point?” asks the analyst cited earlier rhetorically. From Apple’s perspective, a sound and strategic way to get around this stated position would be to introduce refurbished handsets into the market at a lower price point. But in India, it faces two unexpected hurdles. 1. The Indian Mindset: For whatever reason, Indians haven’t gotten around to getting convinced that refurbished phones are as good as the real deal. “Second hand” is how the common man calls it. In the upper echelons, they call it “dumping of toxic waste into third world countries”. By way of an example, he asks, if you don’t think twice about buying a reused Mercedes or BMW from an authorized dealer, why should you about buying a high-end device from an Apple Store and save some money and get the same experience? Gartner lends credence to Roy’s arguments by bolstering it with data from Western nations. “With consumers in mature markets upgrading their smartphones every 18 to 20 months the inevitable question is what happens to the old device? While only 7% of smartphones end up in official recycling programmes, 64% get a second lease of life with 23% being handed down to other users and 41% being traded in or sold privately…. 2. Lobbying: Then there are lobbies at work led by Samsung, Karbonn, Micromax, and Intex to keep the pressure on the Narendra Modi government not to allow Apple to import refurbished phones into India. 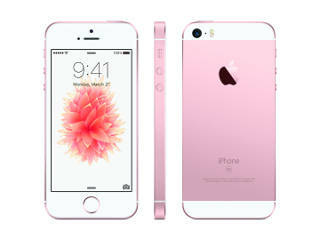 If Apple’s proposal goes through, by 2017 it could very well be selling 10 million handsets each year, Bloomberg reports. That sends shivers down the spines of competitors. “Even if the refurbished iPhones are priced a bit more than 10,000 rupees ($150), that will hurt our sales because Indians may choose Apple for its snob value,” Sudhir Hasija, chairman of Karbonn Mobiles, told Bloomberg. Not just that, in the shorter run, at least in India, it may allow Apple some more headroom. For instance, in many countries, Apple has been able to achieve the kinds of numbers it has because it could tie up with cellular operators who subsidized the cost of the handset. In India, the policy did not allow that. If the proposal to refurbish goes through, Apple can offer newer models at lower prices that customers may be more amenable to as opposed to offering disasters like the iPhone SE—ostensibly built for the price conscious customer, but still out of their reach. The way manufacturing is thought of right now is outright silly. It is nothing but a mug’s game. So why are our policy makers obsessed that Apple manufacture iPhones in India? To come to terms with that, consider the set of numbers that follow. In the last quarter, Bloomberg reports that Hon Hai Precision Industry Co, Foxconn’s parent company, saw quarterly profits fall 9.2% and operating profits shrink from 3.81% a year earlier to 3.69%. Foxconn is a contract manufacturer for many technology companies including Apple and has 12 plants in China. Its affiliate FIH Mobile, which assembles devices for Xiaomi Corp and Sony Corp, warned that income for the first half of the year could plunge by as much as 92% from a year earlier. But this isn’t a new story. This is how it has always been. Take a close look at this chart that Bloomberg put together around the difference in net profit margins between Apple and Hon Hai. The latter makes just a little more than grocery stores. The thing about Apple is, all of the products are designed (read, the high-end, intellectual work) at its headquarters in Cupertino, California. Sporadic media reports have emanated that Foxconn’s human resource practices are among the worst in the world. There has been a history of suicides in the company on account of its bad working conditions. In January 2012, about 150 Foxconn employees threatened to commit mass suicide to protest working conditions. Foxconn’s argument is that to make even the kind of monies it does, it has to deploy labour in its factories in 12-hour shifts, six days a week. 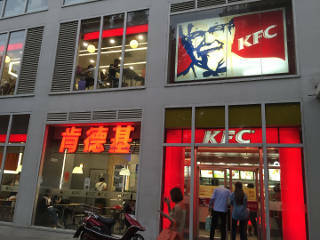 This is the kind of thing that can work in China. Foxconn can get away with it. But can it get away with something like that in India? In India, the company started operations in Tamil Nadu in 2006. But by 2014, on account of differences between the management and the unions, it shut down the unit. It affected 22,000 people. Last year, the company announced it will set up 12 factories across India and create one million jobs. The question is, does India really need the likes of Foxconn? As things were in 2012, Apple had managed to squeeze Foxconn to work with it at an operating margin of 1.5%. This, even as Foxconn continues to accede to Apple’s demands for technical changes and higher orders. If relationships of these kinds that Apple have forged with Foxconn are to be broken, it will come at a huge price— financial and human. The problem is, Indian policy makers don’t seem to get it. On the face of it, there is a doomsday scenario. India is staring at a shortage of jobs: 300 million people got into the workforce in 2013, but the economy could employ only 140 million. When looked at linearly, this problem exacerbates and by 2050 another 250 million people will enter the job force. God alone knows how many will be unemployed then. But, looking at problems in a linear manner is no way to deal with them because it relies on data from the past. You need models that can predict the future. That is why Arun Maira, former chairman of BCG India and member, Planning Commission, argues that the fear which plagues policy makers and job seekers alike that new technology will make people obsolete is a ridiculous one. His assertion is that this fear is unfounded because human beings are the only appreciating assets of an enterprise. The value of all other assets—including machines and robots—will depreciate with time. It is only people, and not the machines, buildings and materials, that have the ability to learn and improve their own capabilities, and human beings can improve the capabilities of manufacturing processes and machines also. Various subsidies have been offered to Foxconn to set up manufacturing in India. Implicit to these subsidies are two questions. 1. A senior bureaucrat who did not want to be named spoke of the time he was assigned with the task of wooing Foxconn to his state capital. The chief minister asked him to pull out all stops and “get the company in at any cost”. He followed instructions, took charge and stayed in touch with the top management at Foxconn. On their part, they had a set of dos and don’ts in terms of protocol to be followed when Terry Gou, Foxconn’s chairman and CEO was in town. This included a diktat that the visit be kept strictly hush hush and no media personnel be allowed. When Gou’s private jet landed though, he was accompanied by a contingent of 60 Chinese media personnel. Not just that, they reneged on every promise they made in their list of to-dos before Gou’s visit. So much so, that he kept the chief minister of the state waiting until 9 pm and he finally did not turn up. But he did spend an inordinate amount of time with Gautam Adani, chairman of the Adani Group. When the bureaucrat checked with his counterparts in other parts of the world, it turned out, Foxconn has a history of not living up to its promises. What it puts on paper is one thing—whether it delivers on that is something else altogether. Brazil being a case in point. When looked at from that perspective, the Maharashtra government’s decision to offer the kind of subsidies it has to Foxconn sounds ridiculous. Business Standard reports that Maharashtra has offered 2,000 square feet of office space on rent in the plush Cuffe Parade area in Mumbai and 150,000 square feet in the Mahape industrial area, Navi Mumbai on lease for the production of Xiaomi and Reliance Jio's Lyf smartphones. For the Cuffe Parade office, the state government agreed to bear the rent. Then there are other sops that include a subsidy on fixed capital investment without any limit on the amount and an additional 20% capital subsidy above the central government subsidies. This apart, the company will get 100% exemption from stamp duty during the investment period, cash subsidy of 50% (or up to $10 million a year) on research and development costs and exemption from local body taxes such as property, land and entry tax. So far, nothing has come out of it and the Devendra Fadnavis-led government is beginning to feel the jitters. Given a history and work ethic like this, the real question to ask, the bureaucrat says is, do we really need companies like Foxconn and the jobs it offers in India? 2. The second question that bothers him is: How does Foxconn make money? Like it has been articulated above, the company operates on wafer thin margins—much like a grocer. If you consider the fact that Apple currently makes a bulk of its revenues from hardware, it has an operating profit margin (OPM) in the region of 30%. The only other company that comes anywhere close to these kind of numbers is Microsoft with an OPM of roughly 26%. But strictly speaking, Microsoft is a software vendor. Every other hardware manufacturer makes operating profits a little over 10%. Dell and Blackberry operate in single digits and are gasping for life. So, if a company like Foxconn can work at margins in the region of 1.5% and still flourish, it has to have the tacit support of the state. Given the company’s record, and Apple’s history with the company, does it make sense then to offer sops to Foxconn? How long will it go on and can it be sustained? That is anybody’s guess. “In the short to medium run we have to create and offer jobs. Foxconn claims it will do that. Which is why everybody is trying to woo the company,” says the bureaucrat. “But after my interactions with the company, I don’t trust it one bit. I have no idea how they make money,” he says. It wouldn’t be outlandish then to suggest that the Indian government hasn’t understood the nuances of Apple’s longer term strategy and the significance of Cook’s visit to India. Just before Cook set foot on Indian shores, he visited China—his eighth visit to the country, as against his first to India. On that visit, he announced a $1 billion investment in Chinese taxi ride-hailing service Didi Chuxing to “help the company better understand the critical Chinese market”. “We are making the investment for a number of strategic reasons,” Cook told Reuters. “Of course we believe it will deliver a strong return for our invested capital over time as well.” It is another matter altogether that the company, Uber’s strongest rival in China with an 87% market share and valued at $25 billion, has been losing billions every year. While most investors reckon this is one of the surest signs of Apple’s interest in getting into self-driving electric cars in the future, fact is this investment does not give Apple even a semblance of control in Didi. More on self-driving cars and other investments later. What is interesting here is the nature of the investment. As a thumb rule, Apple prefers to buy smaller companies and absorb their technologies into its products. Then why did it invest in Didi, wonders Stratechery’s Ben Thompson in his newsletter. He has a few theories. The Chinese App Store is massive for Apple. In 2015, it generated $3.4 billion in revenues for Apple, next only to its home market in the US. That number, Thompson estimates, will breach $4.5 billion in 2016 and will catapult China as the most important market when it comes to Apple’s services-as-growth opportunity. Earlier in April, China blocked access to the iBooks and iTunes music stores. Perhaps, it was just to prove a point to the company that the government has the muscle to barricade growth. When all of these are extrapolated, is it possible, Thompson wonders, that Apple was compelled to invest in Didi? (It is worth noting that the Chinese government is an investor in the hugely loss-making entity that is Didi). Apple has had an amazing run in China, but there are some very real challenges emerging on the horizon—no different from what many other US technology firms have faced while dealing with the government. When looked at from that perspective, Apple needs to hedge its bets and India by virtue of its sheer size is a good place to begin with. To do that, Apple needs to first create a larger ecosystem in India. But as articulated earlier, it is unwilling to get into the mug’s game and play in the Rs 5,000 ecosystem. The analyst cited earlier, who has seen Apple from close quarters, says that in other parts of the world, “50% of Apple’s revenues come from selling iPhones. And telecom companies are its partners. So if they buy two million handsets from Apple, the onus is on them to sell it.” Apple creates the ambience and it is able to do it right by setting up stores to create shock and awe in a consumer’s mind. That makes the telecom operator’s job easier. The most obvious way to play catch-up is to begin someplace—and that someplace is by introducing refurbished, certified phones into the country. It helps Apple’s cause because with a larger handset base, it can start to think of building a larger services ecosystem in the longer run. 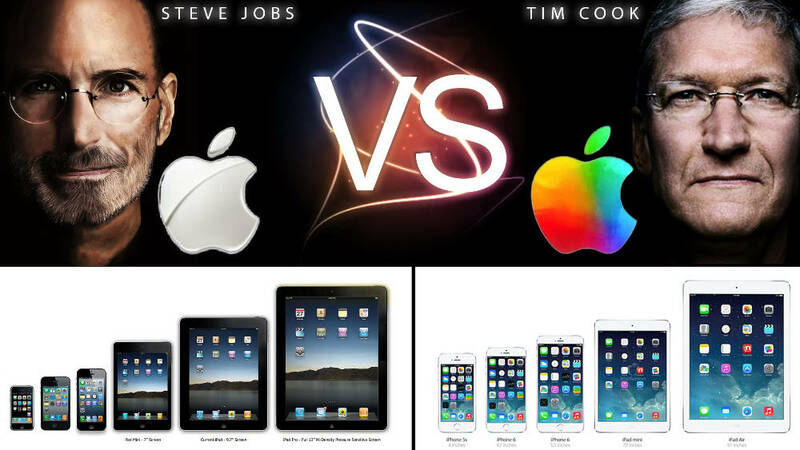 In any which case, Tim Cook knows there is only so far Apple can go selling handsets. But Apple’s long-term strategy is clear. It is morphing into a services company. To get a grip on that, first take a look at this chart reproduced below. In the first instance, what do we mean by Apple services? Okay. So there’s a camera there. What do you do when you run out of space to store pictures? You buy space on Apple’s iCloud. That’s a service. You like to listen to music, watch movies, have television shows at your disposal, listen to audio books, change ringtones and need a piece of software as well to manage all of it on your Apple device? Not a problem. Subscribe to iTunes. Then you need to work as well for which you need software to write on, create spreadsheets, make presentations and what not. All of it comes bundled when you subscribe to iCloud. And all of it stays synchronized on iCloud across all of your Apple devices. Apple charges a small fee for each service. It was never intended to be that way. But that’s how it is turning out to be. 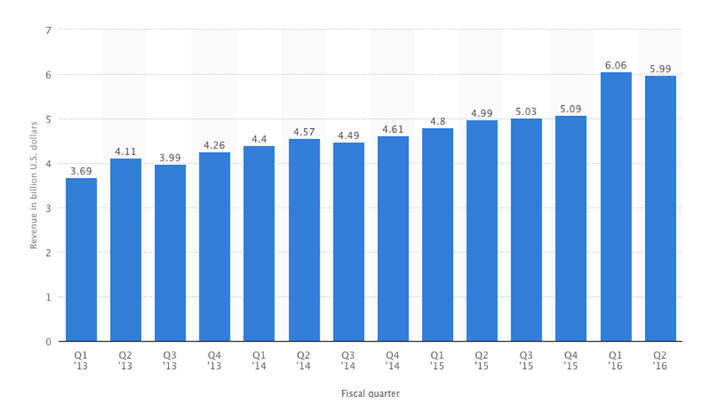 And like the chart above illustrates, in the last quarter, Apple Services earned the company $6 billion in revenues. That’s pretty much the kind of money Time Warner, the American media and entertainment conglomerate, earns in a year. HBO makes marginally more than that and Netflix is right now in the region of $4.7 billion. With the kind of monies Apple has at its disposal—$233 billion in cash—it can buy all of these companies at one go. But one of these it will buy. Because Apple, at the risk of sounding repetitive, is no longer a handset or computer manufacturer. It is transitioning into a services company. For that, it needs to come up with quality content, quality software and quality applications—and that includes a driverless car—to fuel business for the long run. Projects of these kind don’t require manufacturing expertise. What they need are design, high-end coding and software skills—all of which India possesses. More pertinently, it provides a higher return on investment to both the people on the projects and India. A glimpse of what Cook wanted to get a sense of was evident from the heads of four companies he met, all of whom develop apps for the Apple ecosystem as well. 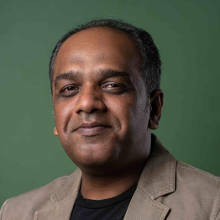 These include Urban Clap, a service aggregator, Cynapse, a high technology platform that seeks to integrate productivity, collaboration and information management between knowledge workers, Invention Labs, a company that builds apps to help differently abled children learn and Sweet Couch, an app that tries to mimic the window shopping experience. They couldn’t be more different from each other. But what they did offer Cook was a glimpse into what is possible from India. To that extent, India was a learning experience. There is another dimension to the services part: iPhone as a platform or a marketplace. Recollect what we said about the billions of dollars Apple is raking in through its App Stores, and also its keenness to sell refurbished phones in India. The power of platforms connect the two. The more iPhone users Apple has, the more the number of App developers it can attract, and the more the apps, the more the number of customers, and the more they will use the phone. Apple is not just a product, but it's also a platform, much like Uber, Airbnb or Facebook. And it also increasingly benefits from being one through network effects and the ability to scale at low marginal costs. That said, Thompson points out, Apple has a long way to go as well to develop the services ecosystem. “Services, though, have a very different business model. First, there is precious little evidence that consumers are willing to pay more than a nominal amount for services (if that! ), which means the most profitable services make money through volume. Secondly, services are effectively free on a marginal basis; the real costs are fixed, which means that services business have a strong economic imperative to reach as many people as possible. What Apple does next is anybody’s guess. It certainly has the cash to spend. Time Warner or HBO because Apple needs a steady service of content for Apple TV and iTunes. Netflix. Instead of launching its own streaming TV service, why not just acquire the market leader? Twitter seemed unstoppable once upon a time. But it could do with a saviour right now and Apple can use this microblogging platform to beef up Apple Music and Apple TV. An electric car that Apple is reportedly chasing. Elon Musk and Cook have met. And what better acquisition than Tesla?